U.S. Border Patrol Agents dismantled a catapult system at the border fence. The two bundles of marijuana found by agents weighed more than 47 pounds combined. Editor's Note: The drug catapult was originally found in February 2017. The Border Patrol photo and information have been re-circulating on social media in light of recent border coverage. The article has been updated. 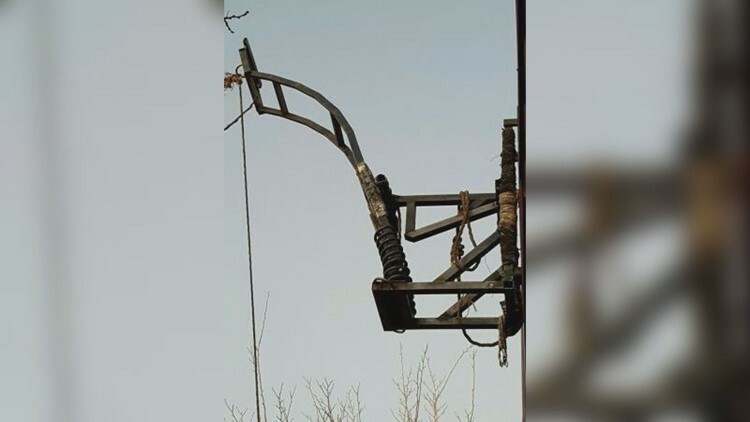 A stunning image of a drug catapult is again making the rounds on social media platforms, showcasing the types of challenges federal authorities face on a daily basis when it comes to stopping drug smugglers. In 2017, Border Patrol agents in Arizona seized two bundles of marijuana and dismantled a catapult used to hurl them into the United States from Mexico, CBS News reports. The device was found just east of the Douglas Port of Entry. Combined, the bundles of marijuana weighed more than 47 pounds. After agents disassembled the catapult, Mexican authorities took it. Federal authorities tell CBS News that smugglers have a habit of throwing drug bundles over the border, and they seem to like to shoot them across with devices such as air-powered cannons and similar-looking catapults. Smugglers have even placed vehicle ramps next to the border fence to use ultralight aircraft to drop shipments in the desert.